IPTV Set-Top-Box Emulator Pro for Android allows you to open web portals designed to run on IPTV STBs to watch internet TV. This is the Ad free latest full version APK of IPTV STB Emulator (Pro), which is much smaller in size, and it supports software remote controls for MAG 250. You can download the APK below. 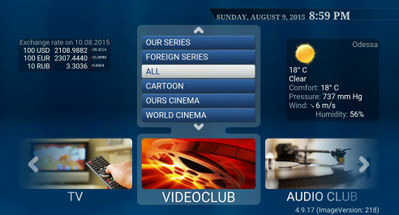 Android's IPTV Set-Top-Box Emulator application requires Android 4.0 and up. - Updated Exo player to v1.5.9. - Added password protection for settings (disabled by default, default password: 0000). - Fixed compatibility with some other (not based on Stalker) portals. - Fixed Auto player in some cases selected wrong player to play a stream. - Fixed some Android 6 and N compatibility issues (the app couldn't read device's storage). - Fixed empty action list in key maps editor. DEV NOTE: This app is designed to be used by experienced users. To work correctly it must be configured first and if you've never configured STB MAG 250/Aura HD it may be difficult for you to configuring it. READ WIKI.